Only the back of this astrolabe survives. 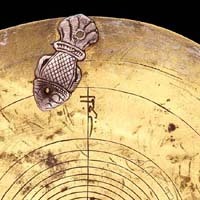 The earliest African astrolabe in the collection, it was made in Cairo by Hasan ibn ‘Alī. He has given it the Islamic year of 681, which in the Christian calendar is 1282/3.